Yesterday was one of the most dramatic monkey rescues we have ever performed. 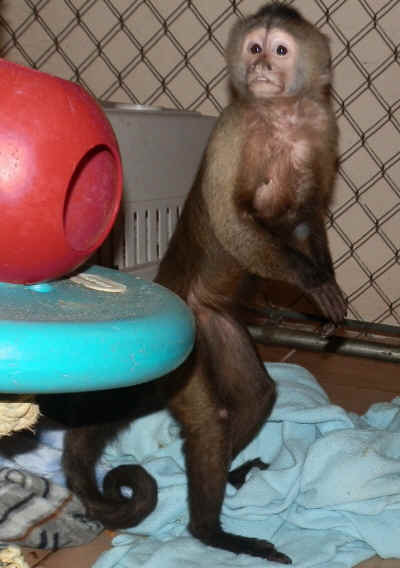 We got a call from Debi at Second Chance Animal Rescue, who was working with Animal Control on the Florida coast, to rescue Annabelle, a young weeper capuchin. Annabelle was abandoned in a filthy, mold-infested trailer that had been occupied by hoarders. Annabelle's presence there was illegal. She was confined to an old, rusted, small cage, with nothing but dirty rags to sleep on. It was over 100 degrees in the house and there was no evidence of water or food available for her. Poor Annabelle's suffering seems unimaginable now, 24 hours later, when you see her playing and exploring her new home at Jungle Friends. Annabelle's living conditions were unbearable to Kari for even a few minutes. This precious creature had to sleep every night in these filthy blankets, imprisoned in a rusty cage for 7 years. Although the humans in the house lived in the same horrific conditions, they had a choice. Annabelle didn't. The emotional effects of her ordeal will take a long time to heal, but with lots of fresh air, good food, monkey friends, and room to play, Annabelle will have a happy life. Who needs a superhero when you have Claude, the champion monkey catcher? 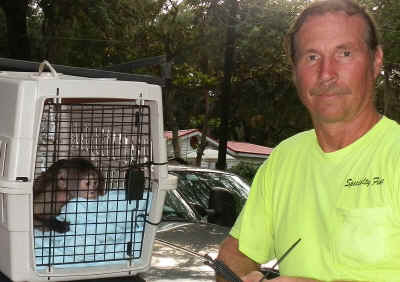 He came to Annabelle's rescue when Animal Control was unable to catch her. When Claude arrived, he was told that Annabelle had escaped her cage and was hiding in the garbage that filled the master bedroom. A cookie, calm words, and a clean blanket were all our Claude needed to coax a little monkey out of her filthy hiding place. Annabelle grabbed the blanket and wrapped herself in it, making it easy for Claude to gather her up and put her in a carrier for traveling to Jungle Friends. She snacked on apple slices and then slept for the two-hour journey. Things were a little different when Annabelle got to her new home. She was very nervous, pacing around, bouncing and rocking to comfort herself. But after worrying us all night, in the morning Annabelle seemed to realize that a whole new world had opened up for her! Annabelle spent today climbing and playing, learning to use her automatic waterer, and eating just about everything we put in front of her. She picked all the veggies out of her bowl and ate them first -- she knows what is best for her! The neighbors who told us Annabelle's name, said that the 'owners' used to take her outside up until she was about a year old, then Annabelle started biting and was confined to a cage for the next six years. Now she gets to live in a safe, clean and natural habitat. 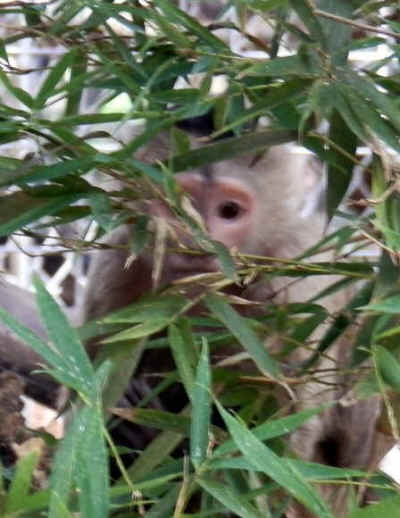 Annabelle peers out from the bamboo in her new home, looking for her first sponsor! All the boys in neighboring habitats are eyeing the new girl, and who will she choose? As we know, hoarders usually don't limit their sad collections to just one animal. This case wasn't any different. A cat named Cherokee is now safe with the Humane Society, but two macaws and a boa constrictor are still unaccounted for. Florida Fish and Wildlife is investigating the case.